Aim: To attempt to capture evidence of paranormal phenomena at a location that to our knowledge, has never been investigated before. Hiding in the undergrowth beside the disused airfield and industrial estate at Detling is Binbury Castle. This was once a fine mote and bailey castle that was later turned into a manor house. It retains the majority of its enclosing ditch. The bailey is no longer traceable except on the north east side where, on the line of the curtain wall at the point where the bailey joined the ditch of the mote, there is a mural tower, the remains of the mediaeval manor-house. This is oblong on plan measuring 4.5m x 3.3m internally, and stands to a height of about 7.5m; its walls of knapped flint and rag stone are 1.9m thick. It is heavily buttressed on its north east face and altered elsewhere by the insertion of brick chimneys and various building additions. The remains of the curtain wall are visible on its south west wall and are traceable as footings along the north west and from there to the edge of the ditch. Although the barns are still in use the farmhouse, Binbury Manor, has long been demolished. To our knowledge this site has never been investigated and as the accommodation is not that big it suited perfectly the small three man team we had in operation that night. It was a blank canvas and we like those a lot, you never know what your going to get! Ghost Connections - Ian, Kim, and Dave. Use of EVP, still photography and camcorder to record the evenings events whilst calling for spirit in the hope of capturing evidence of paranormal activity. Dave and Kim had been to Binbury earlier in the day as the place was so overgrown Dave had to cut back a lot of nettles to get safe access to the building. After meeting up with Ian and returning to the castle, and successfully explaining our presence to the land owner (and his shotgun! 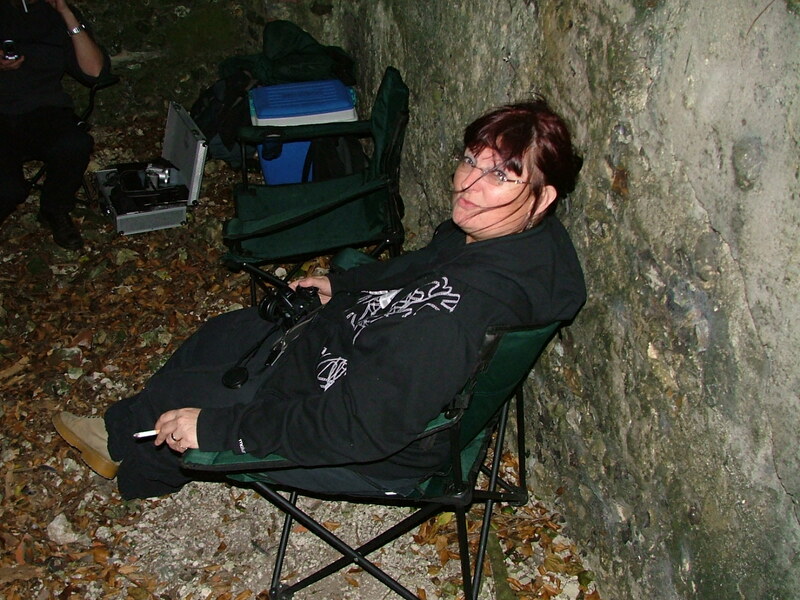 ), it was 9.30pm by the time we had got camped and comfy in the base of the mural tower. It was quite windy which left background noise on the EVP and camcorder audio. Both side of the tower are open creating a tunnel effect leaving you with quite a draft whistling through. Dave started calling for spirit who explained why we were there and introduced ourselves. Just as he finished the wind instantly dropped to almost nothing, very uncanny! Dave described it as if someone had just closed the door. The wind was still blowing outside the tower as you could hear it and see the trees moving, just nothing within the tower. Kim said she even felt warm? This lasted for a few minutes till Dave called for spirit to confirm if they had done this, the breeze seemed to start coming through again. Ian tried calling for spirit activity, in particular, for the chains hanging in the fireplace to be moved. These were swaying a little naturally but sadly, despite Ian keeping the camcorder focused on the chains nothing happened. Dave at this point thought he heard a "click" from the fireplace but this was not caught on the camcorder. Dave called for the noise to be repeated which it apparently was, this time also heard by Kim but still not Ian and still not caught on the camcorder. Dave tried calling again but this time no response. He tried again as both he and Kim thought they heard a creak outside the walls, but this was not repeated and so put down to natural causes. This was discussed, the noise sounded more like a creaking door than a tree in the wind. For some reason Ian was not hearing any of these noises? After a brief break the team swapped sides of the room to avoid the breeze that was whistling though, and at 10.15 started again with Dave calling for spirit, Kim heard a noise behind Ian (who now had the fireplace behind him), although this was not heard by Ian (no surprise there) and Dave. We were disturbed for an instant by the noise of lorry's arriving late on the adjacent industrial estate. Dave then thinks he sees a faint light in one corner of the room and then all three think they hear what can only be described as a faint scrubbing noise. Dave called for spirit to repeat this noise, it wasn't and considering the adjacent activity and radio from the industrial estate we'll have to put this down to a natural noise. Ian tried calling for spirit remarking on confidence levels, meaning if something was here it should be more confident about showing themselves as some time had now passed, reassuring that we meant no harm. At that point Dave felt his left arm being "lifted" and then to his surprise the chair he is sitting in tipped up from left to right almost tipping him out of it! The ground was a little unstable as Ian had taken a tumble out of his chair earlier in the night, but Dave’s was on a completely flat area with only one slightly unstable area being to the front, so why he tipped out sideways we couldn't fathom. he later said that he could feel his arm lifting and was pondering about what was happening when he had the larger shove that almost tipped him over. Dave recovered and both he and Ian called for spirit, if it were spirit, asking with tongue in cheek that they do something for us may be less forcefully. There was a loud "thud" heard by all three, although we could not place where it came from as one thought it was from outside, one inside and the other behind us? We did not put it down to the activity on the industrial estate as this had finished by now. We kept going till 11.30pm by which time we decided we had exhausted anything we could try in such a small venue and decided to stop, broke camp and moved on to a second venue we had planned for later that night. If you want to see what happened there have a look at our report on Stone Chapel. The atmosphere at Binbury is a calm comfortable one, and at no time did any of us feel unsettled. There were occasions when we thought we heard noises, but given how exposed to the elements the property is we have to consider that these could quite easily be explained as natural phenomena, or noises coming from the adjacent industrial estate. Regrettably no unexplainable occurrences were caught on any of our equipment. There was a degree of information forthcoming of a clairvoyant/psychic kind, these may have been clairvoyant in nature but this cannot be validated. As Ghost Connections conducts scientifically based investigations we do not publish any psychic or clairvoyant observations. However, this information is held on a separate database. Should you wish to see this information please email us at enquiries@ghostconnections.com. Although this information cannot be treated as evidence it at least gives food for thought. What does Binbury offer us? The rare opportunity to help oneself to a historic site that must have an abundance of tales to tell. This was only our first visit to Binbury and nothing came of it, but that does not detract from the fact that it is a lovely place to visit and even to stay at overnight. We did leave with the thought that there is something about the place that needs to be unlocked, and in true Ghost Connections style we will not give up, and will plan a return trip when our schedule allows.